$18.99 This item is selling for $18.99 on eBay. Top-Rated SellerBuckysCollectibles consistently earns high ratings from buyers thanks to fast shipping and excellent service. Premium SellerBuckysCollectibles has been a Platinum member on Bonanza since July 15, 2018. 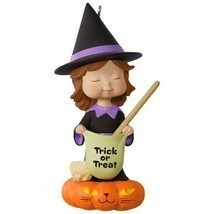 This is a new 2017 Hallmark Keepsake "Sweet Trick-or-Treater Witch" Mary's Angels Halloween Ornament. The item is in new condition. The boxes are in good condition, they can vary from original photos shown. Please look at all the photos before purchasing. If you have any questions please let us know. Make sure to look at our other listings for more ornaments. 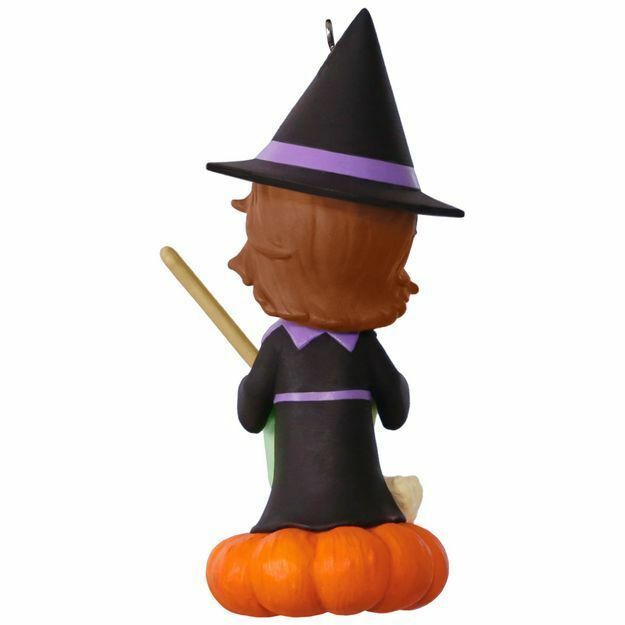 From Hallmark: Sweet Trick-or-Treater Witch Mary's Angels Halloween Ornament PRODUCT DESCRIPTION Let this Halloween ornament cast a spell over your tree. Inspired by the adorable Mary's Angels Christmas ornament series, this spooky cute, angelically adorable witch stands atop a cute, cat-themed jack-o'-lantern in full Halloween wardrobe, including broom and trick-or-treat bag. Learn more about Keepsake Ornaments. Halloween ornament. Designed by Mary Hamilton. Dated 2017 in copyright. Pre-packaged for easy gift-giving, preservation and storage. 1.7" W x 3.4" H x 1.6” D Company Policy: Shipping: Shipping cost is FREE for this item within the US states. Please allow up to 1-4 business days to pull, pack and ship orders. We advertise a 2-3 week delivery time with most items arriving under 2 weeks from date of purchase. Please note, we have no real control over the delivery time it takes the US post office to deliver your item(s). We are able to ship to other countries, but you will need to use the Global Shipping Program to do so. We are not responsible for any items damaged, lost or stolen when shipping if shipping insurance is not purchased. If you would like to purchase shipping insurance as a precaution for damaged or lost items, please let us know and we can get that for you. (Extra fees will apply for adding insurance). We use only brand new shipping boxes with bubble wrap most the time. Please check your email for the tracking number which will appear after shipping label has been processed. Returns: You may return any common stock items for a refund, credit, or exchange by requesting a Return Merchandise Authorization (RMA) within 30 calendar days after delivery. We offer free shipping on all products, but that offer only extends to received and non-returned items. This means you are responsible for all shipping costs and methods. All general returns are subject to a 20% restocking/cancellation fee. The restocking/cancellation fee is simply put in place because it costs us money to process, box and ship an item to you. Any general returns or cancellations will be credited the purchase price minus any applicable restocking/cancellation fees. Returns will not be accepted on any item(s) that have been altered, painted, damaged or used in any way unless the item is sold as a used item. All returns must be authorized and approved by Bucky's Toys and Collectibles. Accepted Forms of Payment: Payment can be made through Paypal. I will ship immediately when Paypal money is confirmed! Please, no personal checks! Pay securely with your credit card or bank account through Paypal. We shipped to the confirmed address on Paypal so make sure to have the correct shipping address in there when you check out. I expect full payment within 3 days. Additional instructions: We are not responsible for any items damaged, lost or stolen when shipping if shipping insurance is not purchased. If you would like to purchase shipping insurance as a precaution for damaged or lost items, please let us know and we can get that for you. (Extra fees will apply for adding insurance). Notes: Any ornaments with batteries we do not test beforehand, so we can not guarantee they will be charged and working. Our items are new and purchased from Hallmark stores directly. We do get 1000's of ornaments a week, we are not able to open up and inspect every ornament inside the box. If there is an issue please notify us. All new ornament boxes are in new and good condition but can have marks or creases on them from being moved or in the store. We do our best to show pictures of all sides of the box. Please contact us with any questions you may have before bidding to avoid confusion and bid retractions. Feedback: Feedback to all customers will be left once your payment is sent thru paypal and your label has been printed. Please notify us before posting negative feedback, we are willing to resolve any reasonable issue. We appreciate your business and thank you for shopping with Bucky's Toys and Collectibles.